With these words Swiss chemist Doctor Albert Hofmann describes the events of April 19, 1943, the date of the first consciously induced LSD trip. Since that time, LSD has become one of the most controversial pharmaceuticals ever developed, a substance that changed the life of its discoverer Dr. Hofmann, as well as the lives of tens of millions of others. 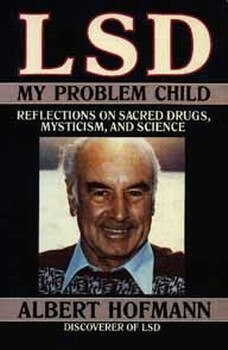 In LSD : My Problem Child we follow Dr. Hofmann on his journey of discovery: the painstaking research, the courageous self-experimentation, the meetings with such notables as Aldous Huxley, Timothy Leary, mycologist R. Gordon Wasson, and novelist Ernst Junger. This little-known story of the birth of the psychedelic age will fascinate anyone who has used LSD and wondered about its origins and the mind and circumstances that created it. In its interplay of science, history, and mystical speculation, LSD: My Problem Child suggests to the reader both the dilemmas and the prospects of a truly important discovery, the significance of which has yet to be fully understood. "A fascinating story by the world's greatest organic chemist." Albert Hofmann is the retired director of research for the Department of Natural Products of Sandoz, Ltd., the pharmaceutical firm in Basel, Switzerland. In addition to LSD he has synthesized psilocybin, the active constituent of the Mexican sacred mushroom. Dr. Hofmann has a doctorate in chemistry and is the author of numerous chemical and pharmaceutical research books. With Dr. Richard Evans Schultes of Harvard University, he is the coauthor of Plants of the Gods and The Botany and Chemistry of Hallucinogens.